This essay is adapted from When I Was a Child I Read Books, forthcoming in the spring from Farrar, Straus and Giroux. © Marilynne Robinson. 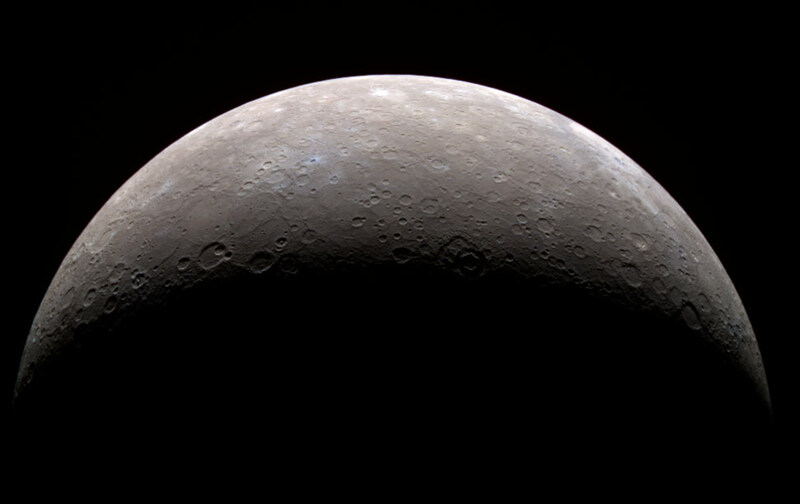 Recently a friend sent me a composite photograph of the planet Mercury. Even as a composite, grossly disfigured to accommodate our strategies of perception, it had about it the great calm and sufficiency the ancients attributed to the spheres. The innumerable scars of eons of local cataclysm were only proof of its indomitability. Someone has named the more visible of these scars. The largest, a gigantic bloom of relative brightness, is Debussy. Machaut, Vivaldi and Rachmaninoff have their craters, as do Rembrandt, Matisse and Derain. And there is a fosse, a trench, called Pantheon, which I take to be a shrine to the unknown, or in any case the unnamed, cultural gods. I like the eccentricity of the choices, which suggests that personal preferences are reflected in them. There is an astronomer somewhere who loves Machaut and Derain. So a record of his or her quietest human pleasures is inscribed, not on the planet, of course, but on its image. More detail has been added to our universe, to the map of what we know in the very human ways we can know it. The thought occurred to me that if the name of everyone on earth who is remembered for any kind of distinction were assigned to a crater or a mountain or a seeming rivulet somewhere in the visible universe, the astronomers would soon be out of names. The universe expands, in terms of the horizons of our awareness, in terms of its own phenomenal life, and again and most dramatically in terms of the horizons of plausible speculation. Indeed, these speculations involve the possibility of other universes preceding or coexisting with this one, in numbers that can fairly be called astronomical. Scatter the names of all those who have ever lived over the surface of the knowable cosmos, and it would remain, for all purposes, as unnamed as it was before the small, anomalous flicker of human life appeared on this small, wildly atypical planet. Say that we are a puff of warm breath in a very cold universe. By this kind of reckoning we are either immeasurably insignificant, or we are incalculably precious and interesting. I tend toward the second view. Scarcity is said to create value, after all. Of course, value is a meaningful concept only where there is relationship, someone to do the valuing. If only to prove that I can, I will forbid myself recourse to theology and proceed as if God were not, for me, a given. Let us say that God is an unnecessary hypothesis here because we ourselves can value our kind. There is perhaps nothing more startling about human circumstance than the fact that no hypothesis can be called necessary, that we are suspended in time ungrounded by any first premise, try as we may to find or contrive one. We may say the human community can provide the nexus of relationship that makes the concept “value” meaningful. But evidence that this capacity is reliably present in us is not persuasive. Interdependency ought to ensure that we will regard one another as the basis of our own well-being, and will reciprocate, service for service, working out the fine points as circumstance requires. This has been a commonplace since antiquity, and it describes the ways of the gentle Tasaday, the dwellers in Utopia, certain religious orders and political movements while they are still drawing up charters and manifestoes, and also certain villages and neighborhoods and exotic places as we remember or imagine them when the here and now is getting on our nerves. The logic of such mutuality and reciprocity seems irrefutable, and so the falling short is always a fresh surprise. Surely somewhere there are people still beyond the reach of Western contact who live as nature would dictate. But an anthropologist proceeding from another premise seems always to have gotten to them first, and to have found them to be the epitome of naturalness as he understands it—xenophobic and homicidal. If we are a young species in evolutionary terms, we may well be old in terms of the span of life our nature will allow us. And still we do not know what we are, or why we act as we do. This has always been as much a practical as a metaphysical question, insofar as the two can be distinguished. Practically speaking, we can persuade ourselves of anything at all and act on it. This often manifests as a bold willingness to be rid of problem populations—intellectuals, for example, or Gypsies or Cherokees or Albigensians or Carthaginians, or sturdy beggars, or degenerates and social parasites. Anyone could add to this list the names of other groups and populations who have suffered clearances, pogroms and outright extirpations. The phenomenon recurs so often it should surely factor into any account we make of ourselves. Historical retrospect allows us to identify with past victims, with their humanity, with the fact that they were simply going about their lives and could not on any reasonable grounds be blamed for the real or imagined difficulties or the anticipated disasters that brought down real disaster on them. We can admire whatever traces remain of distinctive forms and motifs; we can retrieve the fragments of poetry and regret a loss whose dimensions such remnants can only suggest. Still, after so much history, those irritations at certain elements of society, certain problem populations, have never gone away, and are now clearly resurgent, becoming normalized and respectable, as they have done so often in the past. This teeming world, so steeped in its sins. No one could begin to count them. This does sound like theology of the darker sort, the kind that would make us all inheritors not so much of primal guilt as of a primal predisposition to incur guilt. We moderns are supposed to have liberated ourselves from such thinking. Belief in a bent toward acting badly has been taken to inhibit our potentiality for acting well, though why this should be true is not obvious. In any case, because we have behaved badly under both dispensations, we have provided ourselves with strong evidence for the soundness of the darker view—bad behavior for these purposes being defined as any act or omission, individual or collective, that diminishes human life. This standard might strike some as narrowly anthropocentric, but the interests of our species are so deeply intertwined with those of the planet that this definition should serve well enough. Surely no Russian who read these words could have felt otherwise than threatened by them. To “appall human imagination” is no mean feat, after all. The US secretary of state and the British foreign minister both claimed, in the days that followed, not to have been aware of the contents of the speech before it was delivered. Churchill said truly that he spoke in a “sad and breathless moment.” Any lover of humankind must regret that the world could not have caught its breath, healed and rested a little, before decisions were made that would shape and seal its future, as the perfection and deployment of these “dread agencies” have done. Stalin saw Churchill’s vision of the role of the “English-speaking peoples” as equivalent to Hitler’s vision of the role of the German-speaking peoples, that is, as their having by nature a right and obligation to control the future of the world. It must be said, he had a point. If, from a Western perspective, there were problems with the Soviets’ pursuit of Soviet policies in regions they controlled or influenced, it can hardly have come as a surprise. And Stalin’s rationale for maintaining a Soviet empire, that it was necessary for defense, is entirely analogous to Churchill’s rationale for maintaining a British empire. Granting the dangers of our moment, it is certainly questionable in a number of ways to conjure up the sense of crisis that swept the world during and after World War II, and especially to invoke the sense of existential threat with reference to carefully selected items in a national budget, or a perceived inadequacy of zeal in some part of a workforce. But this kind of language has become almost commonplace. For example, earlier this year a then probable presidential candidate, Indiana Governor Mitch Daniels, made a speech in which he said, “In our nation, in our time, the friends of freedom have an assignment, as great as those of the 1860s, or the 1940s, or the long twilight of the cold war. As in those days, the American project is menaced by a survival-level threat. We face an enemy, lethal to liberty, and even more implacable than those America has defeated before…. I refer, of course, to the debts our nation has amassed for itself over decades of indulgence.” Beside the recent financial crisis, which these thinkers always forget to mention, there is also the fact of our having indulged in two long and costly wars, and having indulged in taking up the novel burdens of security present circumstance requires. In such matters—securing nuclear sites, for example—it is easy to weigh the cost of what is done against the cost of failing to do it. A sound economics would apply this test in all cases. It would be harder then to rationalize austerity, or to permit the onus of fiscal peril to be shifted onto the dependent and the vulnerable. Prominent political figures in America warn fairly often of economic holocaust, the destruction of all that has made us great, and a descent into the abyss of Frenchness, even Greekness. Mutatis mutandis, presumably. Not Chineseness, though, which, by this mode of reckoning, ought to be a name for our aspirations. Over the years we seem to have become habituated, even addicted, to the notion of radical threat, threat of the kind that can make virtually anything seem expendable if it does not serve an immediate, desperate purpose of self-defense—as defined by people often in too high a state of alarm to make sound judgments about what real safety would be or how it might be achieved, and who feel that their duty to the rest of us is to be very certain we share their alarm. Putting to one side the opportunities offered by the coercive power of fear, I am obliged by charity to assume that their alarm is genuine, though I grant that in doing so I again raise questions about the soundness of their judgment. In this climate of generalized fear civil liberties have come under pressure, and those who try to defend them are seen as indifferent to threats to freedom. The world is indeed dangerous, and for this reason the turning of our society, and of Western society, against itself is flatly contrary to any rational strategy of self-defense. But this is highly consistent with a new dominance of ideological thinking, and very highly consistent with the current passion for austerity, which gains from it status as both practical necessity and moral ideal. Anxiety has taken on a life of its own. It has become a succubus on our national life. I grew up in the cold war, in that long moment of anxious quiet called the “balance of terror,” the era of “mutually assured destruction,” when the Iron Curtain was a dominant feature of life. We were taught to believe in the reality of an antagonism that might end in apocalypse. Apocalypse was not merely figurative language then, of course, and it is not now. But the nature of the antagonism was sometimes a little difficult to grasp. Each side proposed a way of life that was claimed to maximize human happiness. With all the problems the notion involves, we have come to a place where it would be tonic to hear that old phrase, The greatest good of the greatest number. As children we were encouraged to admire Russia, all those little Pioneers in their red scarves and very white shirts, their arms somehow always full of flowers, outdoing us in every measurable skill. I was led to believe that my peers and I were a slovenly lot who could never aspire to the first rank at anything—democracy and prosperity, those two great proofs of our superiority, were somehow deeply stultifying in their effects, so we were told. For this reason America was forever outskated, forever beaten at chess. Her youth would never truly master the violin. The 12-year-old gymnasts of the Communist Bloc would forever tie themselves in tighter knots than our 12-year-old gymnasts. Their poets were treated by them as cultural treasures, while our poets, to the extent that they even deserved the name, loitered in a profound obscurity that served them right and still indicted the rest of us. I need not say how utterly Soviet youth outshone us at math and science, or how inevitably these attainments fed into the ever increasing power and precision of Soviet missiles, in tribute to which we sometimes crouched under our desks. Human history is in large part nonsense, and I think it is appropriate to pay tribute to the percentage of the nonsense that is not tragic, that is harmless, even benign. Looking back at the challenges flung to us by the Soviets in our long struggle for hearts and minds, it is striking to realize how elegant, how courtly, they tended to be. Their dancers and their skaters carried themselves like Romanovs, grave and unapproachable, aesthetically chaste and severe. It is striking as well how effectively their classicism governed the competition. Ballet was suddenly urgently important in America. Our orchestras were heroes of democracy for doing well just what they had always done. The Russians rejected Modernism, and we looked a little askance at it ourselves, or flaunted it to the point of self-parody. Behind it all was an unspoken assumption, carried on from the nineteenth century, that a great culture proved the health, worth and integrity of a civilization. This was a sensitive issue for both countries, Russia having entered late into the Europe its arts so passionately emulated, America having entered late into existence as a nation. There are respects in which Russians were a good adversary. When they launched their first satellite, my little public school became more serious about my education. They helped to sensitize us to the hypocrisy of our position on civil rights, doing us a great service. This is not to minimize all that was regrettable, the doomsday stockpiles and that entrenched habit of ideological thinking, which lives on today among us, often in oddly inverted form—in the cult of Ayn Rand and the return of social Darwinism, for example. The use of culture as proxy, its appropriation for political purposes, yielded a fair amount of self-consciousness and artificiality. Perhaps it compromised the authenticity of culture in ways that have contributed to the marginalization we see now. Still, given certain inevitabilities that beset the postwar world, the Russians were interesting and demanding of us, until our obsessions drifted elsewhere. In the event, the competition between the United States and the Soviet Union may have been about economics. Or at least it seems to have come to an end on these grounds, if it has finally ended. I know we capitalists are supposed to feel triumphant about this, and I may cause scandal by noting that the United States has had a long history of wealth and Russia a much longer history of poverty, that the United States built up its economy during World War II while Russia suffered devastation. Perhaps I lament a readiness for competition that cannot acknowledge its advantage, now more common by the day. Graciousness might well be as appropriate, and emollient, in international relations as in other relations. Indeed, graciousness might be the most valuable consequence of objectivity. Russia fielded those soldiers of austere accomplishment, those concert pianists and chess masters, so effectively that they allowed us to forget what for the world’s sake we should have remembered, that we were inevitably perceived by them as an overwhelming threat. I return to all these things on sleepless nights when I fall to wondering about the present state of my culture. I have always identified the United States with its best institutions and traditions, its best thought, believing, and having seen, that they could act as a corrective to the less admirable aspects of the culture. I have profoundly enjoyed the wealth of experience that has been offered to me, and I hope I have made some use of it. Yet it seems to me, on the darkest nights, and sometimes in the clear light of day, that we are losing the ethos that has sustained what is most to be valued in our civilization. This may sound alarmist. But it is true, to paraphrase Franklin Roosevelt, that fear is very much to be feared, not least because it is a potent stimulant. Nothing is so effective at foregrounding self-interest. Yet fear is the motive behind most self-inflicted harm. Western society at its best expresses the serene sort of courage that allows us to grant one another real safety, real autonomy, the means to think and act as judgment and conscience dictate. It assumes that this great mutual courtesy will bear its best fruit if we respect, educate, inform and trust one another. This is the ethos that is at risk as the civil institutions in which it is realized increasingly come under attack by the real and imagined urgencies of the moment. We were centuries in building these courtesies. Without them “Western civilization” would be an empty phrase. In the contemporary world nothing of significance occurs in isolation. “Austerity” is the big word throughout the West these days, with the implicit claim that whatever the austerity managers take to be inessential is inessential, and that whatever can be transformed from public wealth into private affluence is suddenly an insupportable public burden and must be put on the block. Everywhere the crisis of the private financial system has been transformed into a tale of slovenly and overweening government that perpetuates and is perpetuated by a dependent and demanding population. This is an amazing transformation of the terms in which our circumstance is to be understood. For about ten days the crisis was interpreted as a consequence of the ineptitude of the highly paid, and then it transmogrified into a grudge against the populace at large, whose lassitude was bearing the society down to ruin. Not long ago, in Iowa, I saw a pickup truck with a bumper sticker that read: Don’t Distribute My Wealth. Distribute My Work Ethic. Iowa, as it happens, is famous for its work ethic, in a country whose attachment to work is so intense it is considered by some an affliction. But in the strange alembic of this moment, the populace at large is thought of by a significant part of this same population as a burden, a threat to their well-being, to their “values.” There is at present a dearth of humane imagination for the integrity and mystery of other lives. In consequence, the nimbus of art and learning and reflection that has dignified our troubled presence on this planet seems like a thinning atmosphere. Who would have thought that a thing so central to human life could prove so vulnerable to human choices? Austerity has been turned against institutions and customs that have been major engines of wealth creation, because they are anomalous in terms of a radically simple economics. As a professor at a public university I feel the effects of this. Of course, legislators are also state employees, but for the moment they are taken to act in the public interest when they attack the public sector. If they were to tell us taxpayers how they spend their time, fiscal demolition would account for a great part of it. The phenomenon is national, indeed global, because every entity with leverage on any other is bringing the same sort of pressure to bear. The countries we call “developing” have dealt with this for many years—as often as the international financial institutions have decided that their economic houses needed to be put in order. Their cultural and political integrity has been overridden whenever these agencies have invoked the supposedly unanswerable authority of economics. And now the West is seeing its own cultures and politics, indeed its modern social history, erased on these same grounds. What has been achieved by these policies in the developing world may be open to debate. Prosperity and stability are creatures of definition and measurement, even when they appear to have been conjured up out of insolvency, which is itself a creature of measurement and definition. It has been a matter of interest since Japan suffered disaster on March 11 that its public debt is more than twice as large as its gross domestic product. If Japan were a developing country, this would certainly have been regarded as insolvency. But Japan is an important economy, so the same standards do not apply. Perhaps these standards, besides their being applied selectively, are suspect on other grounds. Japan has figured in the global economy as a major producer of wealth, no matter how dubious its financial arrangements—which were certainly rendered less dubious by the fact that no external agency would attempt to intervene in such an important economy. It is this supranational power, Economics Pantocrator, that failed us all in fairly recent memory. It has emerged from the ashes with its power and its prestige enhanced even beyond the status it enjoyed in the days of the great bubble. The instability and the destruction of wealth for which it is responsible actually lend new urgency to its behests. This makes no sense. Certainly its authority with the public aligns badly with any conception of rational choice, which is supposedly a pillar of this selfsame economic theory. It can proceed confidently, and moralistically, in the face of common sense and painful experience because it is an ideology, the one we are supposed to believe was the champion of freedom and prosperity in the epic struggle called the cold war. If there was such a champion, might it not have been freedom itself, as realized in the institutional forms of democracy? That is not how the story has been told. We are to believe it was an economic system, capitalism, that arrayed its forces against its opposite, communism, and rescued all we hold dear. Yet in the new era, market economics—another name for the set of theories and assumptions also called capitalism—has shown itself very ready to devour what we hold dear, if the list can be taken to include culture, education, the environment and the sciences, as well as the peace and well-being of our fellow citizens. Two things have happened more or less simultaneously. The world passed through a historic transformation associated with the computer and the Internet. This has been and will be a cause of profound economic and social disruption, and at the same time a great creator of wealth, a great enhancement of efficiency and a great enrichment of life for those who have access to these resources and make good use of them. And then there is a separate development, the inscrutable financial economy abetted by the Internet, which has led to the overvaluing and then the collapse of basic elements of the traditional economy, notably pensions and real estate. Austerity policies, with the threat of worse to come, move people to put money in banks or investments they hope are safe, which no longer include the family home. If I cannot assume my adult children will have the pensions and benefits I enjoy, I will be much more inclined to make sure they have a good inheritance. This amounts to a fundamental reordering of American life. The wealth that was once frozen in appreciated value and thawed at the discretion of the owner, in homes, notably, is increasingly liquid in the hands of international financial institutions. America has had a dynamic economy historically, one that grows and changes in ways that are difficult to anticipate. This no doubt reflects in part the broad distribution of wealth and education that have also characterized the country historically. This was conscious and intentional. Walt Whitman, writing after the Civil War, said, “The true gravitation-hold of liberalism in the United States will be a more universal ownership of property, general homesteads, general comfort—a vast, intertwining reticulation of wealth…. A great and varied nationality…were firmest held and knit by the principle of the safety and endurance of the aggregate of its middling property owners.” To project debt forward as the austerity-mongers do is to assume a predictable future economy, effectively a zero-sum economy that can increase wealth only by depressing costs—wages, safety standards, taxes—that is to say, by moving wealth away from the general population. This prophecy will fulfill itself as education is curtailed and “reformed” to discourage intellectual autonomy, and so on. The new sense of insecurity, the awareness that the rules have suddenly changed, has a meaningful segment of the population furious at government, and desperate to be rid of the institutions that enable a culture of innovation. In any case, in America, an abstraction called capitalism has truly begun to function as an ideology. The word is not included in the 1882 edition of Webster’s Dictionary, and in the latest Oxford English Dictionary “capitalism” is simply “a system which favours the existence of capitalists,” as systems like the self-declared social democracies of Western Europe have always done. In contemporary America it has taken on the definition and the character that Marx, and Mao, and all the pro-Soviet polemicists gave it. This despite the fact that Marx did not consider the United States of his time essentially capitalist. This despite the fact that the United States as a society is structured around any number of institutions that are not, under this definition, capitalist. Suddenly anything public is “socialist,” therefore a deviancy, inevitably second-rate and a corruption of, so to speak, the public virtue. If I could find any gleam of intelligence or reflection in all this, or any sign of successful education, I would be happy to admire it, so passionate are my loyalties. Failing this, I am left to ponder again that this post-Soviet America has turned against its own culture, and has seen cleavages in its population that can only gratify its most fervent ill-wishers. This is an ideal atmosphere for the flourishing of austerity, punitive yet salvific, patriotic in its contempt for the thoughts and values of those of its countrymen who have doubts as to its wisdom, especially if they express their doubts in the press or at the polls. At best there are two major problems with ideology. The first is that it does not represent or conform to or even address reality. It is a straight-edge ruler in a fractal universe. The second is that it inspires in its believers the notion that the fault here lies with miscreant fact, which should therefore be conformed to the requirements of theory by all means necessary. To the ideologue this would amount to putting the world right, ridding it of ambiguity and those tedious and endless moral and ethical questions that dog us through life, and that those around us so rarely answer to our satisfaction. Anger and self-righteousness combined with cynicism about the world as he or she sees it are the marks of the ideologue. There is always an element of nostalgia, too, because the ideologue is confident that he or she is moved by a special loyalty to a natural order, or to a good and normative past, that others defy or betray. I am speaking exclusively of the troubled social and political environment in the United States, not because I think it is by any means alone in its confusions, nor because I believe it is especially prone to them by the standards of other Western countries. It is simply the one culture about which I am competent to speak. At the same time, the march of austerity, with all that means, is international. Historically there is nothing new about it. It is an assertion and a consolidation of power, capable of canceling out custom and social accommodation. It claims the force of necessity, and when necessity is to be dealt with, other considerations must be put aside. We in the West have created societies that, by historical standards, may be called humane. We have done this gradually, through the workings of our politics. Under the banner of necessity it can all be swept away. The alienation, the downright visceral frustration, of the new American ideologues, the bone in their craw, is the unacknowledged fact that America has never been an especially capitalist country. The postal system, the land-grant provision for public education, the national park system, the Homestead Act, the graduated income tax, the Social Security system, Medicare, Medicaid, the GI Bill—all these were and are massive distributions or redistributions of wealth meant to benefit the population at large. Even “the electrification of the whole country,” Lenin’s great and unrealized dream for the Soviet Union, was achieved in the United States by a federal program begun in 1936. Europeans are generally unaware of the degree to which state governments provide education, healthcare, libraries and other services that complement or supplement federal programs, as do counties, cities and other political entities. Because many American states are larger than many countries, their contributions are by no means inconsiderable. These old and characteristic American arrangements do not fit well with a strict construction of the word “capitalist,” as the neocapitalists would understand it. They reflect nothing more ideological than consensus, varying among states and regions, about how best to “promote the general welfare,” a role of the federal government stipulated in the Preamble to the Constitution. These arrangements are pragmatic in nature, and therefore expressive of an effective freedom at odds with ideology. But the ideologues consider such things a straying from the true path. And who has led the march to decline? (Decline is a big concept, apparently based on the assumption that America, unlike every nation that has existed on earth, and despite its history, will never have grave problems to deal with, except those that portend a fall into the everlasting dustbin. So any problem can be seen as grounds for outright panic or at best apocalyptic gloom.) But who is to blame? The government, of course, especially when it is run by Democrats, and by Republicans who now and then act like Democrats. This brings me back to the subject of competition, great ally of austerity. There is the ancient habit of competition among nations, for the biggest fleet, for access to commodities, for colonies, for the technologies of warfare. Even cultural competition is ancient; for example, the Roman desire for an epic to compare with Homer’s. I know Americans are supposed to believe in competition. I think it is wasteful and undignified in most cases. Our competition with the Russians, insofar as it was cultural, was harmless to moderately beneficial. Insofar as it was military, it was disastrous for both sides. I am speaking of those stockpiles and everything that has gone into the making of them. But the story that has currency is that we competed with the Russians and we won. So there is a heightened and ongoing zeal for competition, without a continental power on the other side of the earth to dignify the role of competitor. Since September 11, 2001, some have attempted to put radical Islam in the place of godless communism. But the Muslim world is too diverse, too important to Western interests, too indifferent to the Tchaikovsky competition and speed skating, to fill the role. In need of the focus that comes with having an alien and threatening government to contend with, an appreciable number of Americans choose to consider their government alien and threatening, and, for good measure, socialist. Again, this kind of thinking is eminently compatible with austerity, as the redistributive activities of government are exactly what they choose to be austere about. Other alternatives include returning tax rates for the very wealthy to historically typical levels and cutting subsidies to oil companies. Or there could be a candid admission that the responsibilities of the government involve it in great expense. None of these options ignite populist zeal. This is reserved for attacks—call them “austerities”—directed toward public schools, Social Security, national healthcare, the laws that protect air and water quality. Stripped of all these burdens, America will be able to “compete.” As will Greece and Portugal, I suppose. With whom? For what? China comes to mind, and economic pre-eminence. But China has in many ways already achieved the radical capitalism our ideologues still only dream of. Extreme austerity is its starting place. It has cheap labor, a dearth of environmental and worker protections and a demonstrated gift for capital accumulation, which it uses to position itself globally. A great part of this capital is Western, our civilization betting against itself, even stacking the cards, but never mind. An enormous population with a rising standard of living, engaged in the world economically as the Soviet Union never was, and creating dependency in the West as the Soviet Union never did, is inevitably a global power. If it enjoys a healthy evolution and its people become more prosperous and freer, with greater access to the benefits of the wealth they create, this, objectively considered, will be an excellent thing for the human species, which in terms of population is so largely Chinese. In the best case such a China will overshadow the dear old West in important ways. In the worst case, it will become another geopolitical adversary, and the potential for desperate and devastating great-power frictions will be realized, testing the endurance of the habitable world yet again, and more severely. I would like to see the cost of these contests monetized, as they say. I know I speak hypothetically when I say that nuclear plants might be built on the cheap, designed to operate for thirty years and built to last until their shoddiness is a problem that can no longer be ignored. A great deal of money changes hands, industries hum for a while. And what is the long-term cost when things go wrong? These reactors might, again hypothetically, be built in countries eager to take their place among the producers of exports that must, by every means, be made competitive—that is, far cheaper than they ought to be. How should we reckon cost? And how do we reckon debt? Iowa, my adopted state, has a relatively small population and an economy based on agriculture. This has described the place for as long as it has been a name on a map. Iowa also has a fine system of public universities, which represent many generations of support from the people of Iowa, now more often called the taxpayers, so schooled have we been lately in thinking of our investments as exactions. Especially in the Midwest, state universities are flagship institutions, sources of pride and identity. They are virtual city-states, distinctive and autonomous. They carry on every kind of scholarship and research at the highest levels. Historically they have offered education at modest cost to the people whose support has created them, and have opened their formidable resources to the public freely. Someone seems to have noticed that this sort of thing is not, under the strict new definition, capitalist. Something so valuable as education should be commodified, parceled up and sold. The inefficiency of profit should be added, as a sort of tribute to this economic truth. The word “elite” or “elitist” has currency these days. Its connotations are bitterly negative in some circles. Universities and those who are associated with them are considered elitist, and this somehow disqualifies them morally for positions of public trust. But the whole point of the land grant system has been to create an elite so large the name no longer serves, to create a ruling class that is more or less identical with the population. To raise tuitions and exclude on economic grounds is the sort of “reform” that will create elitism of the worst kind. And how do we reckon ownership? Who owns these institutions? The generations who first broke ground for them? Who saw them through wars and depressions, when the wealth of this present generation would still have been unimaginable? My university is more than 150 years old. It was built on generosity and good faith. Why should all these hundreds of little farm towns sustain such a thing? They have sustained it heroically. Who should own its resources and its reputation? They are very valuable, so there is money to be squeezed out, certainly. There are corporations ready to rent it or buy it piecemeal. It is as if the very idea of a people, a historical community, has died intestate, and all its wealth is left to plunder. This is simply to put in concrete terms questions of wealth and debt and ownership. Those in earlier generations who intended the benefits of education for me did not intend them any less for my great-grandchildren. But the new ideology seems to assume that the public as such cannot legitimately own anything, or obligate the living to anything, for example to providing the same access to education we have enjoyed. Education is associated with prosperity, so there is every reason to assume our shortfall can be monetized in reduced prosperity for our children or grandchildren. This will, of course, make more onerous the burden of debt the party of austerity is always telling us we will leave them, dooming the poor souls to a future yet more Greek. If we educate them well, we give them the means to create a future that we cannot anticipate. If we cheat them, they will have the relatively meager future we have prepared for them. If Mozart is good for the brain in utero, it is no doubt good for the brain in middle age. And so with culture generally, which provides us with the paradigms of thought. What are we doing here? We may never know. If a solar storm should burn off the peculiar damp that clings to this planet, this would be a very small change—no change at all in cosmic terms, which apparently are based on averages. The universe is lifeless now and will be lifeless then, so negligible is our presence in it. What about us was of interest, if we imagine looking at ourselves in retrospect? That we made civilizations, or that we drove them to the ground, reduced them to rubble? I won’t pretend that this is a real question. We make wealth, and we destroy it. Our wealth is finally neither more nor less than human well-being. There is no necessary hypothesis; there is no value but what we value. The great temptation of money is that it seems to give us tokens, markers, by which things and people can be truly said to succeed or fail. The illusion that value inheres in it has vigorously survived a recent proof of its evanescence, in fact its utter dependency on our faith in its value. It has a placebo effect more predictably than it ought to, seeming to satisfy a need to know how value is discovered, or created, or conveyed, or preserved. It is human nature to want to know this. But, whatever else we might say about human nature, we can say it aligns most inexactly with the universe. In this moment the habit of aggressive fear and the zeal for austerity have become a binary system, each intensifying the force of the other as they become a single phenomenon. In the way of the cosmically accidental, this near-fusion has occurred at a point in time when the merely possible took on the character of the inevitable. To put it another way, we have entered a period of rationalist purgation. Rationalism and reason are antonyms: the first is fixed and incurious; the second, open and inductive. Rationalism is forever settling on one model of reality; reason tends toward an appraising interest in things as they come. Rationalism projects, and its projections typically fill it with alarm because of the inadequacy of its model, which, to the rationalist mind, appears as the perversity of the world. To this mind every problem is systemic, therefore vast and urgent. Rationalism is the omnium-gatherum of resentment and foreboding, the omnium-scatterum of everything of any kind that appears to stand in the way of a correction of reality back toward rational standards. Like paranoia, it all makes perfect sense, once its assumptions are granted. Again, like paranoia, it gathers evidence opportunistically, and is utterly persuaded by it, fueling its confidence to the point of sometimes messianic certainty. Ideology is rational, a pure product of the human mind. It is sometimes proposed that we are the creators of the universe—that we create it in the fact of perceiving it. I suppose it would be naïve to ask how this is to be reconciled with all the science that tells us we came to the universe very recently, after a great deal of important business had been transacted here—the emergence of light and matter, for example. It would be interesting to know how so much that exceeds or eludes our understanding and perception can be dependent on them. If time is only an artifact of human consciousness, then we can hardly quarrel on principle with that venerable calculation that put the age of creation at about 6,000 years. By either reckoning, the creation or emergence of humankind is the real beginning of things. Still, the universe of the mathematicians, however important its departures may, over time, prove to be from an objectively existing universe, is unspeakably beautiful. The universe that they manage to capture, however tentatively, out of the totality of phenomena is magnificent for the aura of implication that surrounds it, the tantalizing not-yet-knowable and the haunting never-to-be-known. And there is a much larger, more general sense in which we are creators of the universe. We would not be the first humans to base a universe on fear, and to make sacrifices to allay it that seem unaccountable from the perspective of another culture or generation. We can channel and exploit minds and energies, bending them to use against imagined adversaries. These things have been done any number of times. The alternative is to let ourselves be—that is, to let ourselves be the reflective, productive creatures we are, unconstrained and uncoerced. Eliminate the overwhelming cost of phantom wars and fool’s errands, and humankind might begin to balance its books. After all, its only debts are to itself.